Cities in Motion: Design Classics - Design Classics adds five brand new vehicles to Cities in Motion. Expand the cities transit capabilities while providing your citizens with new and exciting comute options. Cities In Motion: Design Dreams - Rendered in rich detail some of the world’s favorite cities await the steady hand of a planner to manage their transportation needs in Cities in Motion. Cities in Motion: Design Marvels - Design Marvels adds five brand new transit options to Cities in Motion. Cities in Motion: Design Now - One of each of vehicle type, but with a twist! Instead of helicopter take a pleasant ride in a hot air balloon, or perhaps a tram that's been built like a boat to sail the city streets. Cities in Motion: Design Quirks - One of each of vehicle type, but with a twist! Instead of helicopter take a pleasant ride in a hot air balloon, or perhaps a tram that's been built like a boat to sail the city streets. 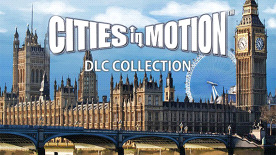 Cities in Motion: German Cities - German Cities is a new addition to the city-based mass transportation PC-simulation game Cities in Motion. Cities in Motion: London - London; the smoky, foggy city on the river Thames. It’s narrow streets and bridges pose a series of new challenges for public transportation. Cities in Motion: Metro Stations - Some of the world’s favorite cities, rendered in rich detail, await a planner to manage and organize their transportation needs. Cities in Motion: Paris - We River cuts through Paris, offering opportunities for waterbus routes while presenting a challenge to those looking to cross its banks. Cities in Motion: St. Petersburg - The great Window to the West and Russia’s second largest city, Saint Petersburg, provides many new challenges. Cities in Motion: Tokyo - With this expansion pack, an all new city has been added to the mass transportation simulator Cities in Motion. Cities in Motion: Ulm - Ulm is a quaint, idyllic German city best known as the birthplace of physicist Albert Einstein. Cities in Motion: US Cities - US Cities is an expansion for city-based mass transportation PC-simulation game Cities in Motion.